Two days to what is supposed to be his handover date, President Yahya Jammeh of Gambia has lost a close ally as his foreign minister, Neneh MacDouall-Gaye, has resigned from office. Mrs. MacDouall-Gaye’s resignation comes barely a week after Gambia’s information minister, Sheriff Bojang, resigned and fled the country in protest over the refusal of Mr. Jammeh to accept the result of December’s presidential election. “This letter serves as a formal notice of my resignation as the Minister of Foreign Affairs of the Islamic Republic of The Gambia,” Mrs. MacDouall-Gaye wrote. “After due deliberation, I am of the conviction that under the prevailing circumstances I cannot effectively serve as foreign minister,” she added. Mrs. MacDouall-Gaye, one of the country’s famous broadcasters was one the most trusted allies of Mr. Jammeh. She had served as the country’s ambassador to the United States, minister of trade, industry and employment, and minister of communication, information and technology. There are reports that she had fled the country before turning in her resignation. Her resignation is an indication that Mr. Jammeh is increasingly being isolated by his close allies. There are unconfirmed reports that the country’s minister of finance and economic affairs, Addou kolley, minister of trade, industry and employment, Abdou Jobe, minister of Environment, Ousman Jarju, may have also resigned from the government. Mr. Jammeh has come under increasing pressure from the African Union, AU, and the Economic Community of West African States, ECOWAS, to accept the result of the December 1 presidential election and hand over to the President-elect, Adama Barrow. While still utilising peaceful negotiations to convince him to step down when his tenure ends on Wednesday, the AU and the ECOWAS are also considering the deployment of a regional military to forcibly remove Mr. Jammeh from office. 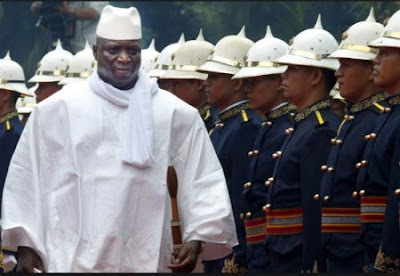 Yesterday, the country’s Supreme Court refused Mr. Jammeh and his party’s application to stop the inauguration of Mr. Barrow thereby rendering his stay in office after Wednesday illegal.